Joyland is a neighborhood of small, single family homes in southeast Atlanta, Georgia and site of a former 1921 amusement park built for African Americans. 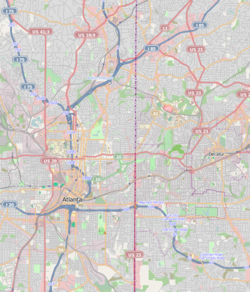 It is bordered by the Downtown Connector (I-75/I-85) freeway on the west, High Point on the north, Pryor Avenue and The Villages at Carver on the east, and Amal Heights on the south. In 1926 a subdivision for African Americans, also called Joyland Park, was built here. Residents included farmers, farmhands and laborers. Lots were around 4,000 square feet (370 m2) in size. Later the Joyland Park public housing project was built in the area. The neighborhood is part of NPU Y.
Joyland Park at the center of the neighborhood was renamed Arthur Langford Park in 1995, in honor of city councilman, Georgia state senator (1984–1994) and minister Arthur Langford, Jr.. Joyland also has a street named after him, Arthur Langford, Jr. Place.